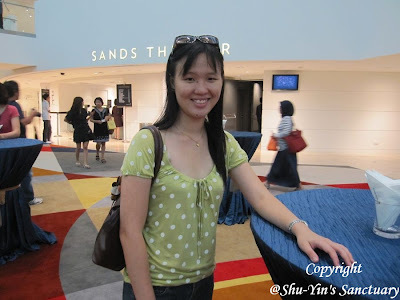 I have not blogged about my recent Singapore Trip this time. 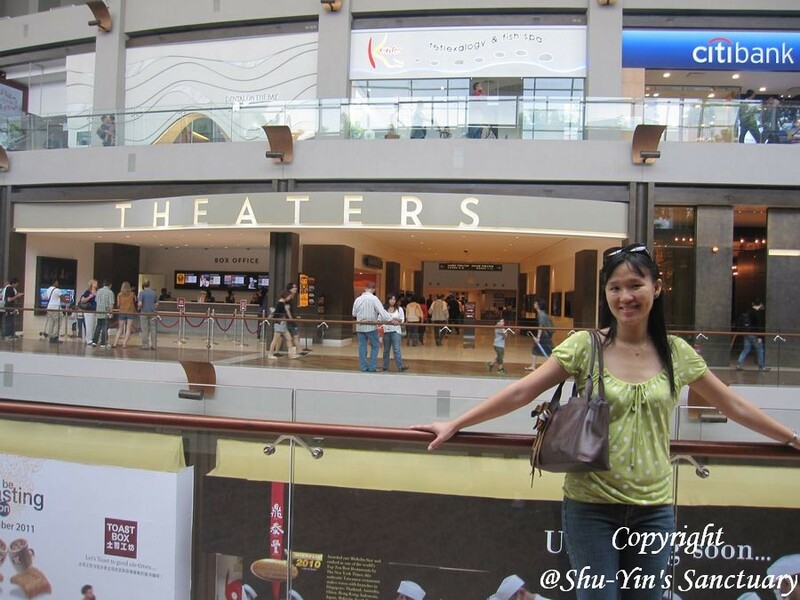 I'm not sure if I'm ever going to blog about my experience in Universal Studio Singapore or upload photos of me doing the touristy stuff. First of all, I am too lazy. Secondly, I have too many backlog posts. But one thing I think I need to blog about is The Lion King Musical I attended in Marina Bay Sands. I tell you, that musical took my breath away! 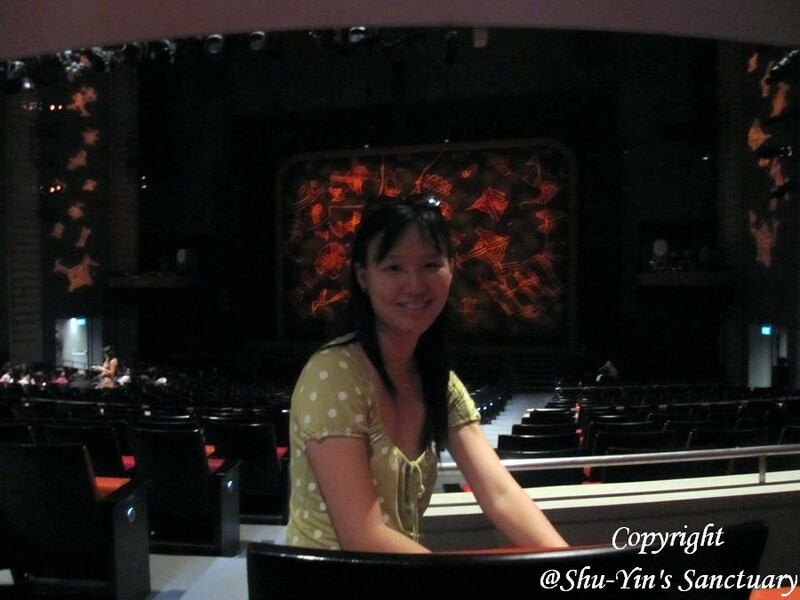 It was my 2nd Broadway Musical I attended. 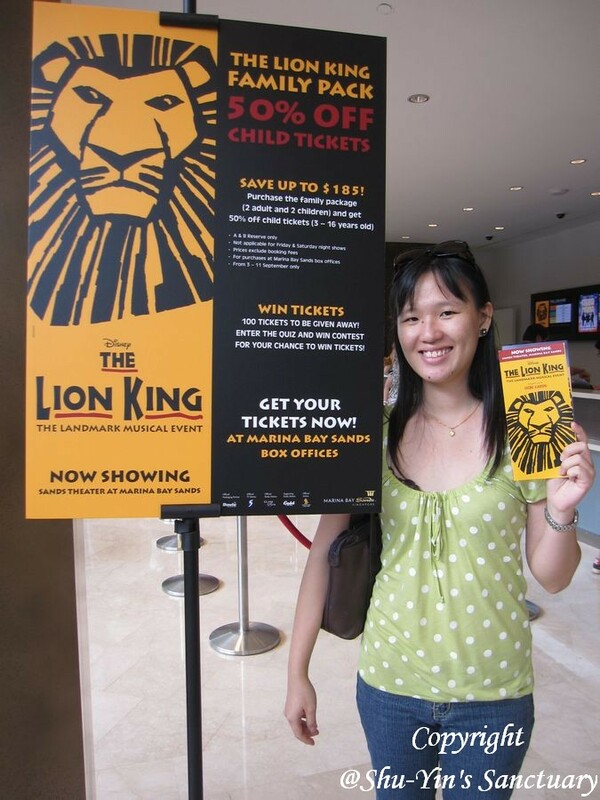 My first being The Beauty & The Beast in 2008 in KL, which was actually nothing compared to this. I think I watched the movie version 1000 times on tv. I loved it. Always has been a big fan of The Lion King. Booked for the Sunday Matinee 2pm show. Ticket prices are from S$65-240. Singapore dollars. Freaking crazy. We booked the 2nd cheapest seats which is the $85, but we got it at a 20% discount, but which I still find it expensive when convert back into Ringgit. That's when I really know how bad our Ringgit fares when compared to Singapore Dollars. Shrug. Took the stall seats after being prepped by my sis-in-law. Turned out great because The Sands Theatre was not that big, kinda small actually and we could see everything not too far away. 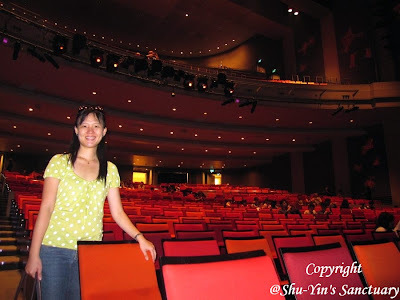 In fact, I did not expect a Theatre to be this small. This was taken from my seat. It was about the size of a large cinema theatre in GSC. Ok, I am not complaining since this allowed me to have a better view. Anyway, I liked the cozy setting. I'm not sure if you could see it but on the right and left side of the stage hanging midway are 2 platforms where each platform has a cast each playing with the instruments. You could really see the whole stage and everything in front of you. This is only possible when the Theatre is small enough. Below photo shows u the seats upstairs. 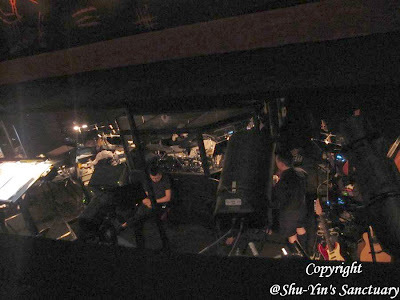 We did not go up but I think stall seats were better since twice during the show, the casts came out from the back door below and also some scene, some of the casts were standing on the alleys of the stall seats. So I was glad we chose the stall seats. The moment the musical started, I knew the money spent was well worth it. I was gobsmacked. It was visually spectacular right from the start. I was amazed by how much the animals really look like animals. Although the animals are actually human, but they really blend into their roles. The way they moved and the way they tilted their heads. Awesomeness! Actually we were not allowed to take photos. 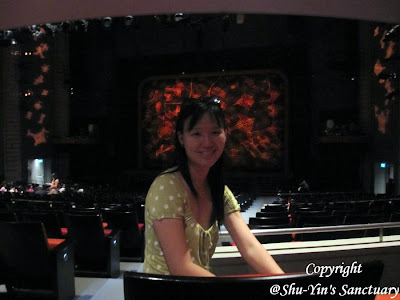 Which I think is fine since I could then concentrate 100% on watching the musical. 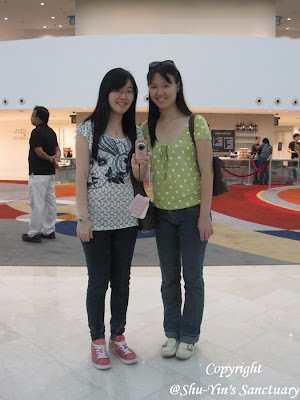 Knowing me, if photo-taking was allowed, I would be busy snapping photos although I know 99% they would turn out all blur. 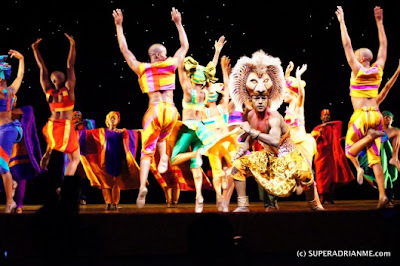 So these photos of the show were taken from the net. The casts were really great. Props used was fantastic. Everything was really good. 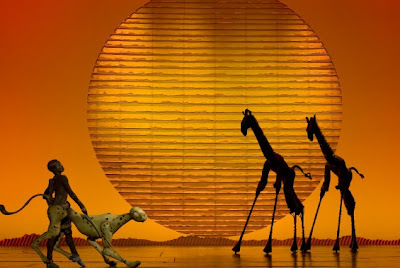 If I didn't know I was attending a broadway musical, I would think that everything was pre-recorded because everything was so smooth, so fluent - their singing, acting and etc. 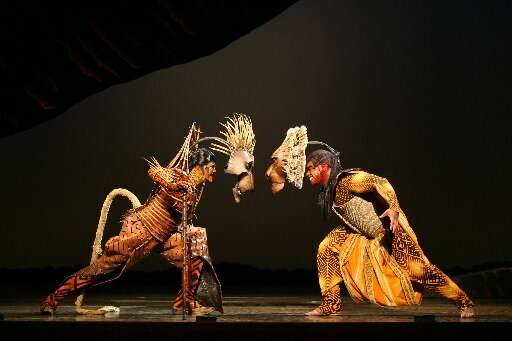 Below shows Scar and Simba - having a heaty head-on argument. I am still amazed at their brilliant masks. When they tilted their head down, their masks would bend forward in front of their face like below. But when they looked straight, their masks would spring up on top of their head, so I could see their facial expression. Isn't that brilliant or what? On this musical, I liked the young Simba, which was played by Warren Saga. He was spirited and energetic and really sounded like the Simba in the movie. I was rather sad he grew up and the adult Simba was played by Jonathan Andrew Hume. Except for his well-toned and muscled body, I did not find myself being his #1 fan, which was rather bad since he was supposed to be the hero. But nevertheless, he was still ok. It was just that I liked little Simba more. Haha. 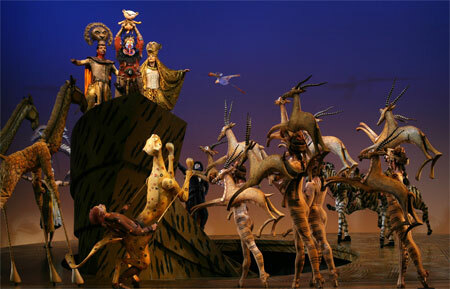 The other casts such as Nala, Timon and Pumba were great. And even the hyenas were terrific. And oohh, I loved Rafiki the wise baboon. She had a powerful voice and really sounded like the Rafiki in the cartoon. Zazu was good too acting his part as the prim and proper hornbill. Overall, I had a wonderful time. Definitely the highlight of my recent Singapore trip. 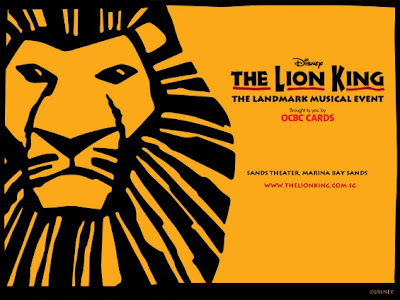 I've always wanted to attend a musical. I will try next time. Lucky for you the theatere was small...looks nice and cosy too!